Sorghum is one of the main staples for the world's poorest and most food-insecure people. The crop is genetically suited to hot and dry agroecologies where it is difficult to grow other food grains. These are also areas subject to frequent drought. In many of these agroecologies, sorghum is truly a dual-purpose crop; both grain and stover are highly valued outputs. In large parts of the developing world, stover represents up to 50 percent of the total value of the crop, especially in drought years. Developing countries account for roughly 90 percent of the world's sorghum area and 70 percent of total output (Figs. 1 and 2). 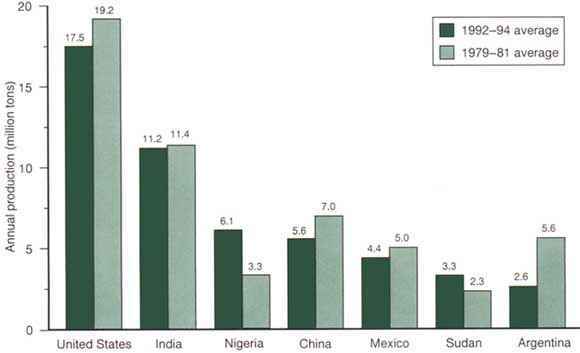 Asia and Africa each account for about 25-30 percent of global production (Table 1). Much of the crop is grown by small-scale farming households operating at the margins of subsistence. Production in Africa remains characterized by low productivity and extensive, low-input cultivation. Production is generally more intensive in Asia, where fertilizer and improved seed are used far more widely. On both continents, sorghum is grown primarily for food. In contrast, in the developed countries, almost all sorghum production is used as animal feed. This categorization i.e., developing countries as food producers and developed countries as feed producers - is generally true, but not always. For example, some developing countries in Latin America and the Caribbean (e.g., Mexico and Argentina) are major producers of sorghum for the feed market (Fig. 1). Correspondingly, this report evaluates production, utilization and trade patterns both regionally and by intensity of the production system. Sorghum production systems fall under two broad groups. · Group I countries (primarily in Asia and Africa) use sorghum for food. The crop tends to be grown in traditional farming systems; yields generally average less than 1 t/ha and can vary considerably from year to year. · Group II countries (developed countries and some developing countries) produce sorghum on a commercial basis, primarily for animal feed. The use of modern agricultural practices is widespread, and yields correspondingly average 3-5 t/ha. Statistical documentation of sorghum production, trade and utilization is generally quite good, especially in countries where production is commercialized. Data are less accurate in countries where sorghum is primarily a subsistence crop, grown in outlying areas. Figure 1. The world's major sorghum producers. Figure 2. Relative importance of sorghum worldwide. 1. Each figure is a 3-year average for the respective period, e.g., 1979-81. 2. Until 1991, area of the former USSR. 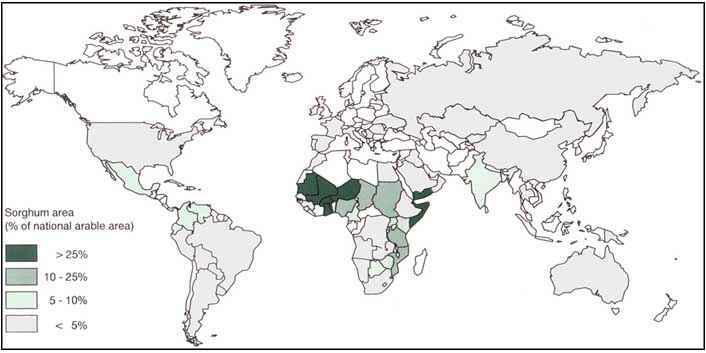 In Western and Central Africa, sorghum is grown throughout the belt between the Sahara desert in the north and the equatorial forests in the south (Fig. 2). In Southern and Eastern Africa it is grown in drier regions, where precipitation is too low for the successful cultivation of maize. Nigeria and Sudan are the major producers in Africa (Table 1), but sorghum is widely distributed, and a key food staple in large parts of the continent. Production in Asia is far more concentrated in geographical terms, with two countries, China and India, together producing 94 percent of the regional total. Sorghum production in Central America and the Caribbean is dominated by Mexico, which produces 90 percent of the region's total. In South America, production is concentrated in Argentina (60 percent of the regional total) and in the dry areas of Brazil, northern Colombia and Venezuela. Developed countries produce nearly one-third of the world's sorghum. In North America, it is cultivated in the central and southern plains of the United States (mainly in Kansas, Texas and Nebraska), where rainfall is low and variable. The United States is the world's largest producer, with over 25 percent of global output. Production in Europe is limited to small areas in France, Italy and Spain. In Oceania, Australia is the only producer of significance.